Place trees in a position that has direct sunlight for at least half the day and protection from strong winds. Water regularly and thoroughly. 1. Fencing the Orchard. This is particularly important if your trees are subject to damage from stock or native wildlife particularly wallabies. 2. For poor soil (i.e. less than 1 metre of top soil and heavy clay soils) Deep Ripping is advised to improve drainage (rip to a depth of at least 45cm). The last Ripping should be down the slope, as deep as possible to help sub-soil drainage. Erosion control will prevent washing out of furrows. 1. If soil is not well drained it is advised to make a circular mound 1.5 metres across and 20-30cm high. This can be achieved by bringing outside loamy soil to the planting site or alternatively mound existing soil. Do Not plant trees in holes in heavy clay soils as the hole will act like a sump and hold excess water. 2. The trees should be watered thoroughly several hours before planting to moisten the root ball. Planting trees out with the root ball dry or partially dry will result in roots being damaged. The site should also be thoroughly watered the day before planting. 3. Make a hole in the soil or mound twice the width of the pot and the same depth as the pot. Remove the tree from the pot and lightly tease roots down side of the root ball and loosen any matted roots at base of root balls. Fill in soil around roots, making sure not to plant root ball any more than 2cm lower than it was in the container. Trees will suffer if planted too deep. Soil should be firmed down well after planting. At least 20 litres of water should be applied to each tree to settle in soil around roots. A saucer shaped depression 50cm in diameter will help hold water when watering in. 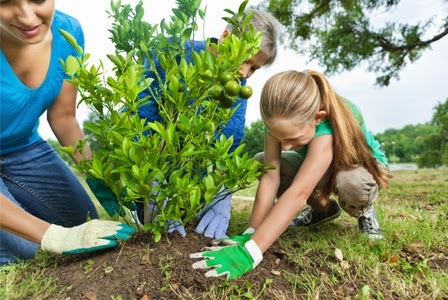 Applying a Slow Release Fertilizer at planting will help the young trees off to a good start. This can be applied by scratching into the surface around the young tree. One of the following or a mixture can be applied. 1. Plant tags and ties – It is important to remove any tags and ties. Even a thin string can ring bark and kill a tree as it grows. Ties can be left on to secure a tree to its stake in the early stages but the tension must be frequently monitored. Relocate labels to an adjacent stake. 2. Weed Control - Most important if trees are to grow quickly. Weeds shouldn’t be allowed to grow within one metre of the tree for the first year. After this keep area out to the drip line (i.e. width of foliage) free of weeds. Mulch will control most weeds. 3. Fertilising-Trees will respond to feeding. How often and how much fertiliser to apply will depend on soil type and the trees requirements (refer to Dept. of Ag 'Ag Facts' for specific requirements). If you do not want to use chemical fertilisers consider applying one or a combination of organic fertilizers (e.g. poultry manure, rock phosphate, blood and bone etc). 4. The use of Organic Mulch is very important for healthy trees. Any organic material can be used, e.g. Lawn clippings, weeds, straw etc. Hay, especially soybean stubble is excellent. As the mulches break down they will feed the tree with valuable nutrients. 5. Watering-Setting up a permanent under-tree sprinkler irrigation system is well worth considering. Frequency and amount of watering will depend on a number of factors, but a good watering once a week is a good guideline. 6. Remove any shoots coming from below graft on grafted trees while trees are young. The removal promotes growth of grafted variety only. Many of us are growing trees in pots so any advice on that subject would be appreciated. Rubber Mulch is great in controlling weeds and stays put rather than being washed away like wood mulch. Please tell me when do you prune a mulberry tree.